Dreams about the deceased. A lot of people dream about people who are no longer alive. In other words, the dead appear in their dreams – and what might that mean? Are they visiting from the world of the dead? Or do they represent something going on within us at the moment? What would they say if they were still alive? On a basic level, the dead might represent a part of you that reminds you of them, or maybe they (and what they meant to you) still influence the way you live your life currently. The deceased as a symbol of your relationship with them or aspects of yourself that reminds you of them. When other (living) people appear in your dreams (see Persons), the dream will often symbolize your relationship with that person. The same is true for the deceased/dead people. When they appear in your dreams, it might be a symbol of your relationship with that person (and as a result, how that relationship is an influence on your life), or the deceased might be a symbol of an aspect you possess that reminds you of that person. In the latter interpretation, it might be helpful to look at what you associate with that particular person, and if that might be a part of you too. The deceased as a symbol of contact. Many people experience – a short time after someone close to them has passed away, for example – that the (deceased) person in question appear in their dreams. Psychologically this is often seen as a way of coping with grief, and whether you experience the dream as a real interaction with the deceased or if you’d rather see it as a beneficial process for you at this moment, well, then dreams about this (deceased) person might symbolize that you are saying goodbye. For this reason, it could take a while after a person has died before you might start to have these “goodbye-dreams”. People are different, so it is very individual how long it takes to accept someone’s death, if it is possible to accept at all. 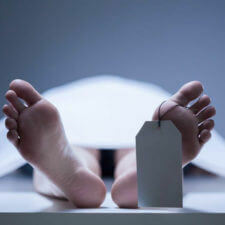 The deceased may also be a commentary on how you live your life – if he/she was still alive, what would they say? What would grandmother/grandfather/my sister (i.e. the deceased) say to me in my current situation, if he/she was still here? NOTE: Sometimes dream interpretation is difficult. The most important thing is that a given interpretation of a dream is only correct, if the person who had the dream feels moved by that particular interpretation – that it fits into their life. I dreamt about defecating in a bucket in front of a married couple while they were in bed going to sleep. I felt awkward but it appeared there was no place else to do this.. I then had to dispose of it and the found myself walking through a corporate environment looking for a toilet to flush it.. I found a parenting room which I quickly went into to an flushed it down only to be told by a women with dark blond hair I should not have done that as baby poo is different to adult poo and it won’t breakdown. I was quite obstinate and went ahead and flushed. She was quite right it resurfaced. I had to then try to remove it with my hands, I was able to retrieve one stool successfully but there was more! There was another woman who was quite supportive close by but like a blurr, the authoritarian type was quite distinctive in the dream. I then woke up and felt quizzy at the thought of the dream.. hence visiting this sight. Yes I have been filled with negative thoughts for years. Not quite sure if the source is my husbands depression or personality disorder and feeling the need to think of my life and what I have left of it!